Over the last few years, the concept of the green life style has been spreading more and more, as the mark of ecology and respect for nature have never been so important. It is no longer just a fad. Now it has become truly a widespread philosophy of life, taking root among the men and women, young and old. According to a survey conducted by LifeGate, 87.31% of the sample considered leads an eco-sustainable life style that is giving priority to the reduction of waste and differentiated refuse collection. The research was conducted among a group of interviewees who lead a healthy life, prefer an organic diet and opt for the use of renewable energy. When buying a product, these consumers are more critical in their selection, choosing recycled or recyclable materials and paying attention to the reputation of manufacturers in terms of environmental sustainability. A concrete commitment may be found among the small and medium enterprises in Italy, who are keeping up with green policies in order to stay competitive with the large multinationals. 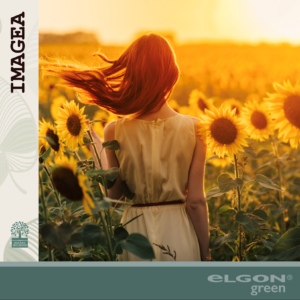 To meet the demands of its consumers, Elgon, thanks to its new Elgon Green Brand, has launched Imagea, the eco-friendly line of professional beauty and haircare products, which follow the standards set out in Mother Science. Trust, professional quality, ethics and sustainability are inescapable values for Elgon Green, the company that is 100% made in Italy.